Competition prevails everywhere in the world. From manufacturing bell pins to beat the world record in races, everywhere competition plays a major role. When it comes to film industry the competition was always with the number of days the movie ran in theaters was the biggest achievement, but in recent times the trend has changed. Number of theaters the movie is being released worldwide, the collection it earns and some clubs have been started as 100 crore club and recently bollywood has also started a 300 crore club and some movies has already paved its way into it. With these on one hand, Youtube plays a major role in the promotions of the movie, were the movie's first look teaser, trailer, motion poster are been released. The biggest achievement in Youtube is the views for the particular trailer or teaser. Bollywood has always been on the top of it always with higher number of views than any other language movies. Tamil cinema has not been far behind with these and now we have started to give a tough competition to the Bollywood contenters with higher number of views. Recently Shankar's 'I' teaser was released and has crossed more than 8 million views and this the record in Tamil cinema with highest number of views in Youtube for a movie in south Indian Lanaguage. With this in one hand, the likes for the teaser and trailer in Youtube is also being compared for the competition like views. Yennai Arindhaal teaser was released before 2 days and got more than 2 million views and the likes for the teaser is what has created history. The likes of teaser in Youtube has crossed 54,000 which is the highest for a Tamil movie. Though there are many Bollywood movies with higher likes, Yennai Arindhaal has paved the way for future records. Social Networks will not be a let out in this comparison, because it plays a major role in making the audience watch the teasers and trailers. Twitter trends has also become a way to compete and many fans fight with posting many tweets to keep the trend on top. A twitter trend #YennaiArindhaalTeaserStormOnDec4 has been on top in India for the 4th day continuously and Ajith fans are making it happen to make it a record. Akshay Kumar's movie #Baby is top in trends for the past 3 weeks. 2. 4lakh plus tweets with a single hashtag. 3. 50k likes in 2days is the record in Indian movies. 5. 2 million views in 56 hours is the fastest after 'I' which got 2 million in 35 hours. 1. Highest views in Youtube for a south Indian Movie. 2. First south Indian movie to cross 5 million views. 3. Among the Indian movie's trailers and teasers, I is the only Tamil film to get a place in Top 10. The hashtags, #MostLikedIndianTeaserYennaiArindhaal and #YennaiArindhaalTeaserStormOnDec4, have been trending on Twitter. The teaser has received tremendous response from them and it is expected to surpass the five-million mark soon. Vikram's magnum opus "I" created a new record when it surpassed the one-million mark within 12 hours. The film broke the record set by "Bang Bang", which achieved the feat within 13 hours. "I" also became the first South Indian film to receive more than 8 million hits for its teaser on YouTube. "Lingaa" teaser grabbed eyeballs, thanks to the presence of superstar Rajinikanth. The teaser went viral within hours of its release on YouTube. The video crossed one million views in less than 30 hours. "Kaththi" teaser is one of the most-popular videos of the year. The teaser fetched good response from the fans and it has got more than two million views. The teaser of "Anjaan" became an instant hit among the audience thanks to Suriya's presence. The video, showing a stylish-looking Suriya received grand response, from the fans and it fetched one million views in less than 48 hours. It has so far got more than 3.5 millions on YouTube. The official teaser of Dhanush's "Anegan," which was released in October, has crossed the one-millon mark. The video has generated good buzz surrounding the film and fans are eagerly looking forward to its release. 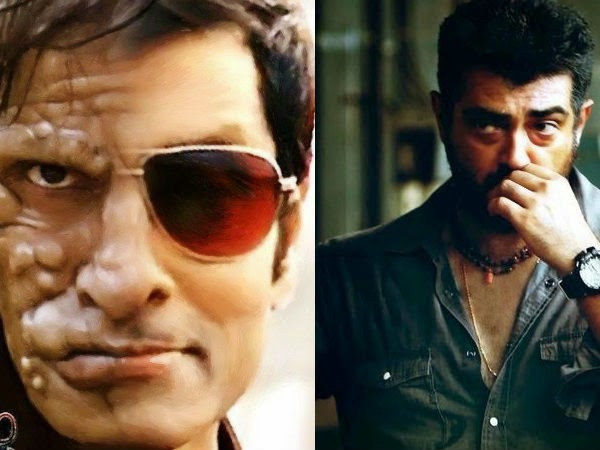 Besides these films, the teasers of "Jigarthanda", "Velai Illa Pattathari," "Naan Sigappu Manithan," "Maan Karate" and "Kaaviya Thalaivan" had received good feedback, though they failed to cross the one-million mark.